There’s been some interest lately for the Commonplace Journal. Yes! Nothing against visual journals, I wrote two books about using visual journals, and I love them both. And here’s an example of an ancient one, because the Commonplace Book has a long history–going back to how guild apprentices learned their craft. A Commonplace Journal (or book) is a place for ideas and pieces of stories, quotes, classes I want to develop, and maps. I love maps and making them helps me put things in perspective or just remember where I’ve been–both geographically and emotionally. 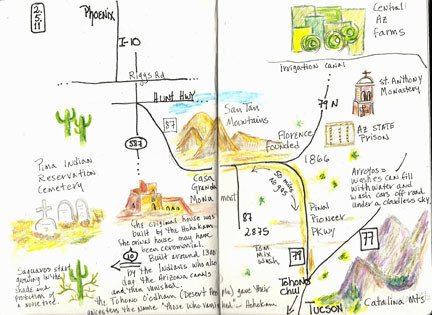 A visual journal is more of a sketchbook, with planned pages. You may start with randomly applying layers of color, then going back and creating a page. 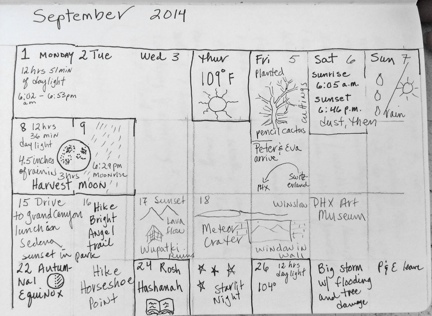 But a visual journal is planned, often with an image on every page or every spread. Not so the Commonplace Journal. It’s a way to capture what you may need in the future, and because you don’t know what that is, each book is a compendium of what you come across in your life–quotes, book titles (those you like and those you make up in case you want to write one), song lyrics, overhead conversations. I’ve written about 10 ideas to use in your commonplace journal, but here are some not-so-private pages from mine. Warning: it’s not gorgeous, not sketches, and not layered. It’s about memory and ideas and development. At the beginning or end of some months, I put in a calendar page. It helps me see what happened in that month at a glance. Each date is not filled in, and some days take up a lot of space. It varies a lot. 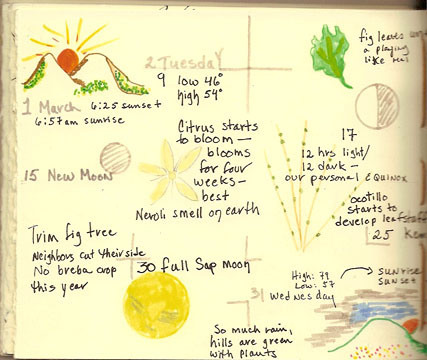 The first one generally mentions the sunrise and sunset times at the beginning of the month, because I am a naturalist, which means a lot of my journal is nature-based. Notice that there are just vague lines separating the days, and not every day is covered. We went to the Phoenix Art Museum and saw an exhibition on Antonio Berni. I didn’t take my journal to the museum, so I just put a quick note of the two exhibits we saw–Japanese pottery and an Antonio Berni exhibit. 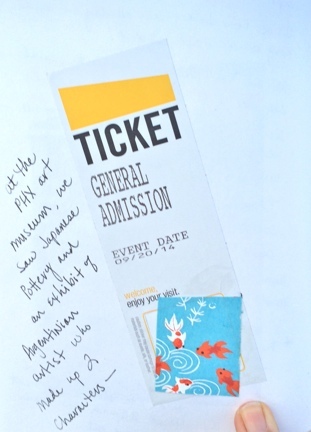 I happened to have a piece of Asian-inspired paper that a friend had sent, so that got put on that page along with the ticket. Another page (not shown) is a detailed report about the Antonio Berni art. Berni is an Argentinian artist who invented two characters who populated his assemblages. Berni was deeply distressed by the social issues of his day–how industrialization changed the opportunities for people to grow and advance, how poverty affected the lives of families, and how politics governed cultural changes. I received a huge surprise gift from far away on my birthday. It was handmade, which always means so much to me. The person who sent them (who is not mentioned because I didn’t ask for permission) uses some great quotes, which I wrote on the page. 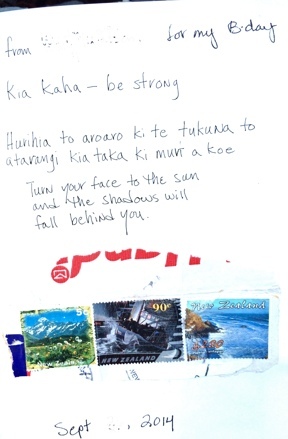 Even the stamps delighted me, so I included those. The back of the page details the gift and what I know about its production. Ideas for art, classes and articles are all hidden in the pages, waiting to be distilled out. Then there are maps. Maps are how we connect locations, but they also work for emotional journeys we take. The first few times I went to Tucson from Phoenix (about 2 hours) everything along the way seemed new. That’s the best time to write down what I saw and thought. 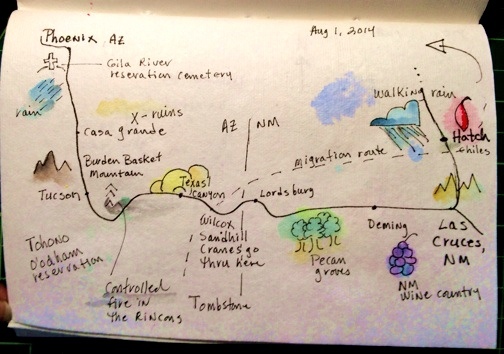 Sometimes I just jot down notes and put them in when I have a chance to sketch a map. The maps are not meant to be in scale, just remind me about what caught my interest. This map was detailed weeks after I did the first sketch. 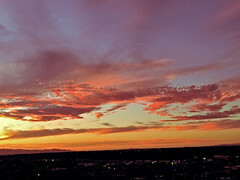 The one above is about a trip I took to Las Cruces, New Mexico. It’s a beautiful drive, and it has inspired several poems. The map helped me remember what I saw and when. This map was done quickly at a rest stop. It was all I needed and I didn’t add more detail. This is a lot and it’s long, but I think that there is a place in today’s world for Commonplace Books, and I’d like to help people get back to using them and creating them. By hand. From the brain and through the heart. —Quinn McDonald is a creativity coach and a naturalist who keeps a Commonplace Journal. Took me a few days to catch up with the full-size photos of this commonplace book. Swoon! 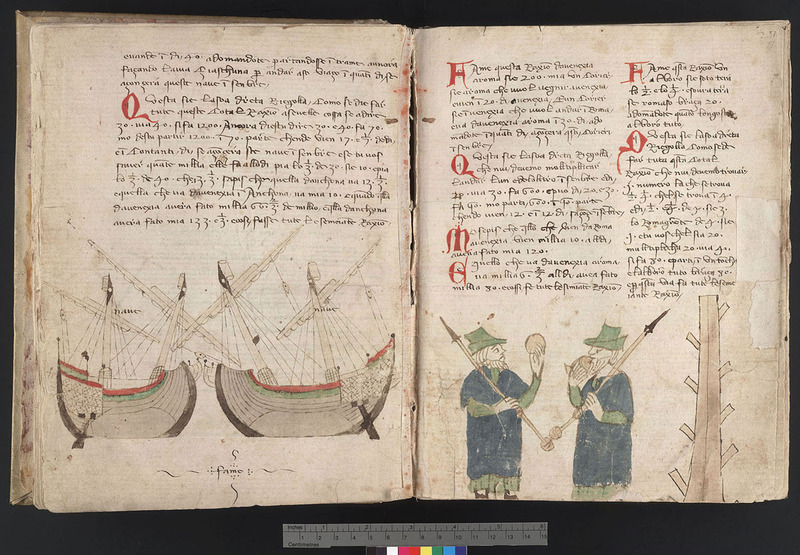 The illumination along the margins and the watercolors–wow! Thanks so much for sharing. Let’s keep the commonplace book/journal alive! Pinterest etc. – no matter how nice they are … just can’t beat the real deal. Saw this great ‘scruffy’ journal today and thought of you. Couldn’t get the Kaisa link to work but found her lovely blog anyway…and have just treated myself to Raw art Journalling! Thanks for sharing all your wonderful thoughts. Love the way she described the fabric. I’ll do an article for emotional maps, but not for a while–it’s busy right now. Hi Quinn, I bought raw art journalling from kobo but don’t seem to be able to read it without also buying their e-reader, is this right? I wish I could help, but I don’t know what kobo is. So I looked it up. They are a Toronto-based company that sell their own ereaders and books. They may have proprietary software. So the only thing I can figure out is that you’d have to contact them to ask the question. Maybe your ereader has an app you can install. I get a magazine like that–I have to download it with a special app to read it on my iPad. Wish I could help more, but it’s way above my pay grade. Hooray, got a reply from kobo and finally got access to the book. I got to kobo via a link of yours to someone you recommended buying it from. Looking forward to doing some raw art journalling now. 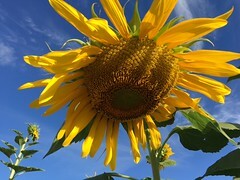 Love reading your posts over breakfast every day, thank you so much for sharing your wisdom. I recommend Changing Hands (independent book store in Tempe, AZ), North Light, and Amazon. I’m glad you found a way to solve the problem! Love the idea of maps in my journal – went for a drive yesterday to see autumn here in the northeast in all its glory – many times during the afternoon wished I had brought my journal along – now I can go home and map out the trip – what I saw – and how I felt as I drove thru the central parts of Pennsylvania. While I love the various art pages in my journal work – there is nothing like my everyday writing – not that it happens every day. Notes and maps can make a huge memory difference. Glad you are a journaler! I love the idea of the Commonplace Journal. It seems to fit right into daily life. And I love your map drawings. So interesting. Those maps have helped me understand so much more than the trip path. Thanks for the kind comment. Thank you, as always! Love your devotion to keeping the Commonplace Book alive. It’s alive and well and may yet become a “thing” –at least in my life. And that’s how we weave people and places into the fabric of our lives . . . by recording their passing. Sometimes it’s a knot or knarl, sometimes an embellishment, but either way the cloth would be poorer for it’s absence. I’ve been weaving a lot lately and ignoring my Zibaldone however an urge to begin again is ripening. I love the weaving metaphor—oh those snarls can be so interesting! But they need to be incorporated into the fabric first. Love this! 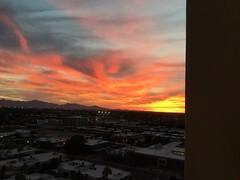 I lived in Tucson for 19 years before I moved to Phoenix 25 years ago. Before Tucson, Ft Huachuca. My family is near Lubbock, TX, so I drove your map many times! Love that part of AZ-NM. This brings back fond memories of trips I took. I once photographed churches in the Hondo Valley. Many of them are gone now. Thanks for evoking my memories of travel. The roads represent my growth to who I am, in ways I had not realized till writing this! How wonderful that writing a memory brought back so much! That the power of a journal. What a great way to start my week! A Commonplace Journal is precisely what I’ve been looking for to keep up with myself and the flurry of passing days. I had been keeping one mostly involving books and reading, but never had thought to extend it out this way. I really like reading your blog and find I relate to so many insights you have and appreciate your efforts and sharing of information. Thanks Quinn! So many people are scared away from journaling because the beat-up, wrinkled journal that fuels our discoveries doesn’t seem enough. Thanks so much! It always thrills me when people get something from the blog.